Problems with woodworm or dry rot? Bugs living in your woodwork? At Total Stop Damp we provide a range of timber treatments to combat woodworm and wet/dry rot. Woodworm is not actually a worm, as many people think, but are types of wood boring beetles and their larvae. Left untreated they can cause weakening of the timber in your home which can be devastating. 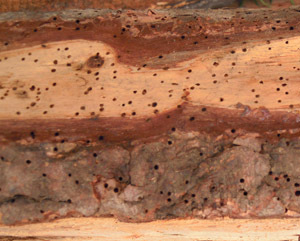 If you notice small holes in your timber/woodwork, Woodworm is more than likely the culprit. Most people are unaware that they are affected and most cases are only found when the property is surveyed before being bought or sold. Call Total Stop Damp now if you require advice on woodworm or to book a free, no obligation quote. Dry rot or brown rot refers to wood decay caused by certain species of fungi, also known as True Dry Rot, that digest parts of the wood which give the wood strength and stiffness. It can deteriorate timber in buildings and other wooden construction seemingly without an apparent source of moisture. Eventually, the decay can cause instability and cause the structure to collapse if left untreated. There are two types of wet rot, brown and white and both be destructive to timber and they have a different affect upon the wood depending upon type. The most common wet rot we find in the home is brown wet rot and is commonly known as Cellar Fungus. The general cause of wet rot growth is a high moisture content within timber for the fungus to establish. Typical causes are gutter leaks, roofing defects, plumbing leaks etc. Damp, poorly ventilated environments are susceptible to outbreaks of wet rot. 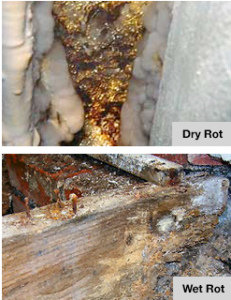 Brown wet rot – The structure of the timber is seriously affected by the rot feeding upon the cellulose. The wood will shrink and crack, become brittle and take on a darker colour, these signs will also appear with a dry rot attack. The shrinking of the timber will create cube like sections but the depth of cracking is generally less with wet rots than with dry rot. This condition seriously undermines the structural integrity of the timber. White wet rot – Spores of wet rot germinate in the pores of the timber, the resulting mycelium feeds upon the cellulose of the timber where it spreads out and eventually produces spores. When released these lodge in the pores of the timber repeating the destructive cycle. The wood breaks down exhibiting a coarse, fibrous appearance with a lighening in colour. This condition undermines the structural integrity of the timber. The attack of such rots requires immediate action if outbreaks are to be controlled. All our timber treatments for woodworm and dry/wet rot are safe and non-flammable and kill all wood destroying insects including woodworm and death watch beetles.